It is being reported that cultural icon and evangelist Billy Graham passed away this morning at his home in Montreat, North Carolina. He was 99 years old. The Billy Graham Evangelistic Association put Graham’s reach at over 215 million during his time as an evangelist. 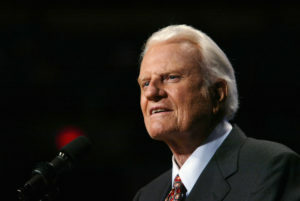 Go to www.billygraham.org for more info on Graham’s reach and cultural impact.